Mrs. B D (Patient identification number 15002) visited the clinic with complaints of urticaria and Under active thyroid (Hypothyroidism). She was suffering from urticaria since 3-4 months and hypothyroidism freshly detected when she visited Life Force. She would suffer from hives once in a month on ears, face and throat and it would last for 3-4 days. She would also suffer from swelling on eyebrows termed as angioedema after threading. There was mild to moderate itching. She used to get these hives before menses associated with mood changes and in humid condition. She was on antihistamins and allegra tablets from past 3 weeks which used to give temporary relief. She had required Tablet Omnacortil (cortisone ) for her acute episodes. She had an average appetite with marked aversion for eggs. She used to perspire more on palms and soles. Her childhood life was stressful as her parents were not in good terms. Due to this she became pessimistic and resentful. After love marriage her outlook towards life changed as her husband was very understanding and supportive. She is very sensitive and emotional by nature and at times she gets irritated on her 6 years old daughter as she has to spend more time on her daughter and there is irritation that she is not able to excel in her career. But she loves her daughter a lot. There was no history of urticaria in the family but her parents were suffering from hypertension. Her mother also had diabetes mellitus and underactive thyroid. 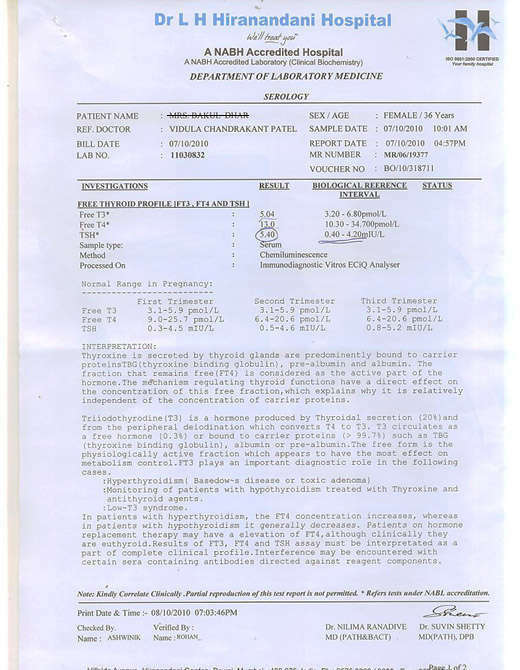 Dr Rajesh Shah studied her case in detail. She was prescribed a research based medicine for urticaria and hypothyroidism. After the medication for a month, her TSH level came to normal. She continued the medicine for urticaria. After the medication for 3 months her urticaria problem got reduced by 90%. The intensity, frequency and duration also got reduced to a great extent. Now she does not get swelling and she was able to stop the conventional medicines completely. She says that Life force has changed my life. During her urticarial attack she would wonder if she will be normal again. Early detection and treatment with homeopathy helped to cure the Underactive thyroid in a very short span.